Today, the tiny little globe atop my bookshelf became a little bit more obsolete1. The southern region of Sudan officially became an independent country, with the reluctant blessing of the rump state of Sudan and the enthusiastic support of much of the western world. Its independence was hard-won, after a decades-long civil war in which millions died and millions more were driven from their homes. As it happens, I’ve got a little bit of a distant connection to South Sudan, even though I’ve never set foot on the African continent. My alma mater, the small Iowa liberal arts school Grinnell College, has a number of famous alumni — jazz musician Herbie Hancock, Intel co-founder Robert Noyce, FDR advisor Henry Hopkins — but hands down the coolest has to be John Garang de Mabior ‘69. Instead of doing something lazy like becoming a musical innovator or inventing the integrated circuit, Garang went back to his native Sudan and proceeded to become a rebel leader. Above: Former South Sudanese leader John Garang, 1969 graduate of Grinnell College. Photo in the public domain via Wikimedia Commons. As an officer in the Sudanese army under a tenuous peace deal, it was his 1983 mutiny that kicked off the second wave of the Sudanese civil war. During his years leading the Sudan People’s Liberation Army, Garang was accused of human rights abuses and murdering political opponents, all while leading more than 50,000 soldiers in a guerilla war against the technologically superior Sudanese army. Garang was killed in a helicopter crash in 2005, shortly after becoming the Sudanese vice president in another peace deal — thus cruelly denying me the chance to someday interview him. 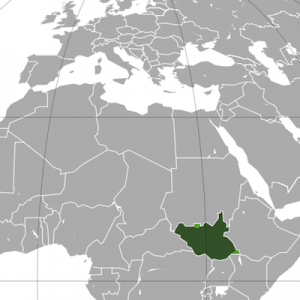 Right: The new country of South Sudan highlighted on a map of Africa. Modified under Creative Commons attribution/share alike license from a version posted on Wikimedia Commons. But just as his leadership in the Sudanese civil war may have forced the Sudanese government to the bargaining table (Garang negotiated the agreement that allowed the south’s legal secession), his death may have been a key step in setting up today’s independence. Unlike most of the other South Sudanese, Garang was not a separatist. He dreamed of a “democratic, secular, and united” Sudan, not the division of the country into a Muslim and Arab north and a Christian and African south. 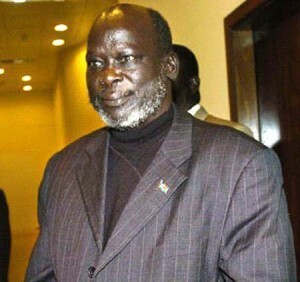 The current Sudanese leader, Silva Kiir, was Garang’s deputy prior to his death. It’s possible that Garang had a conversant relationship with some of the professors I knew at Grinnell, but almost certainly (though I haven’t tracked down any specific links) some of Garang’s professors and classmates during his time at Grinnell College knew some of my professors. So that’s four degrees of separation to the new president of South Sudan2. Of course, as everyone points out, South Sudan has a rough road ahead of it, being desperately poor and plagued with border disputes with its neighbor to the north. It could end up being a new poverty trap despite its oil revenues — or it could defy expectations and develop into a middle-income country. I’m just disappointed a Grinnell alum won’t be at the helm.